This was a partially sponsored trip for purpose of review. 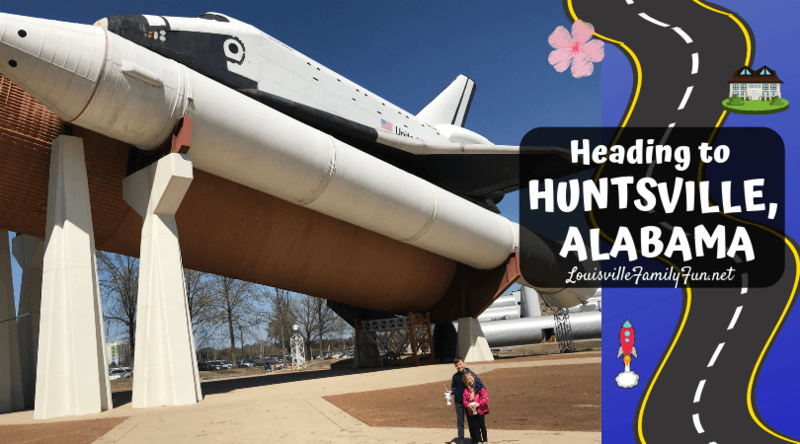 Family Fun itinerary for Huntsville, Alabama. A great getaway for Louisville families. There are many things to do in Huntsville with kids! We took a trip from Louisville to Huntsville, Alabama to see what kind of family fun we could have on this three-day getaway. Many Louisville residents like to take road trips to Nashville, Tennessee for a long weekend, but don’t realize if they drive a little more south they’ll reach another great family spot. Last Spring Break, our family took a weekend trip to Huntsville, Alabama. 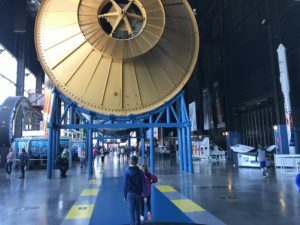 Under the guidance of Rocket City Mom we enjoyed three days of family fun that we are still talking about – tons of things to do in Huntsville with kids. We started our journey early in the morning so we could have a full day of activities once we arrived in Huntsville. The drive to Huntsville is about 4.5 hours and it’s an hour behind Louisville so we gained an hour of exploring once we arrived. First, we went to Burritt on the Mountain, which was a perfect outdoor activity after being on the road. On top of Round Top Mountain sits Dr. Burritt’s mansion from the 1930’s. This unique x-shaped house has a tour for visitors to learn about the interesting history of the mansion and see antiques inside the home. Our kids thought the design of the garage under the house was pretty cool. Personally, I enjoyed the magnificent views of Huntsville from atop the mountain. Try to find the rockets in the distance! Visitors can also explore the six cabin village and experience what life was like for 19th century farmers. Burritt on the Mountain has several special events, but the day we visited there were none scheduled. There was no shortage of fun things to do though. 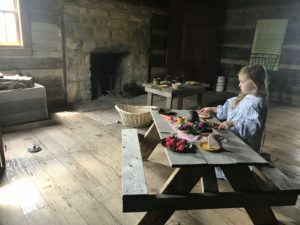 There were farm animals to see, clothing to try on and pretend to tend to farm chores, weaving demos, water fun with 19th century toys, playgrounds, horseshoes, lawn darts and plenty of space to picnic. There were a few interpreters demonstrating skills of the past. Last year, they were completing an outdoor space that was going to be used for spring and summer concerts. This is sure to be a fabulous atmosphere overlooking Huntsville. Our second day took us to the US Space and Rocket Center. This is the largest space museum in the world showcasing rockets and artifacts of the US space program. We would suggest you plan to spend an entire day at the museum. We also suggest packing snacks, waters and a picnic lunch. Because we were at the museum all day, the food and drink cost added up, but now we know we can bring in our own! Another suggestion we would have is to check out a map of the center before your visit. Plan your day around the exhibits and special Imax and 3D movie times. On the day we visited there were several school field trips at the center so we ended up trying to maneuver around the large groups and start our exploring on the other side of the center. It’s a large place, so this was not a big deal. Some of our favorite areas at the US Space and Rocket Center were the Saturn V Hall where you can see an authentic Saturn V Rocket expanding the length of the hall. Rocket Park outside was pretty amazing also. These are the rockets you can see from Burritt Mountain. In the Rocket Park area, there are rides for all ages to enjoy. There was a space shot ride and G force simulator for those that are daring and have a strong stomach. The Mars Climbing Wall inside the center was another popular spot along with the Hyper Ship, a 5 minute motion based simulator. If you want some downtime, visit Spark Lab where families can sit and build, observe and create together. With the largest collection of rockets and space memorabilia on display in the world, there is something to see, touch, climb into, read, and just marvel at at the US Space and Rocket Center. Adults and children can get lost in the wonder of space travel and exploration and if they want to expand their interest even more there are Space Camps for adults and children. After our long day at the center, our family decided to eat dinner at the nearby Bridge Street Shopping Center. This center is reminiscent of the Paddock Shops, but much larger. There are several restaurants, a carousel and shopping if you have the energy for it. After dinner, we headed back to our hotel. We stayed at the Embassy Suites which was centrally located near the three attractions we knew we were going to visit. There was a nice walking path along a water park outside the hotel which led to the Huntsville Museum of Art. The water had hundreds of large koi fish and ducks that the kids enjoyed watching and feeding. The outdoor space around the hotel and indoor pool were a hit with our kids. The adults enjoyed the complimentary wind down happy hour each evening. Our final day in Huntsville took us to the Huntsville Botanical Garden. Just when we didn’t think we could top the US Space and Rocket Center, we discovered this beautiful 112 acre garden. When you pull up to park, it’s hard not to admire the magnificent white house inviting you to see what is behind its grandness. Parents, grab a coffee from the café and a map and start your journey through the gardens. We picked a path and walked a circle stopping to explore each new exhibit and place we came upon. It was great to see our kids enjoy outdoor play spaces. The simple spaces included a rock garden table, train exhibit and gnome garden where we played in quiet and beauty surrounding us. Trails led us through wooded areas where there was something new around each turn. We took a break and enjoyed a snack in an area set up with several hammocks. We continued onto an area set up with a fort, playground, interactive garden and mining for gems center (this is an extra $7). It’s hard to pick our favorite spot, but the Children’s Garden and Purdy Butterfly House were at the top. 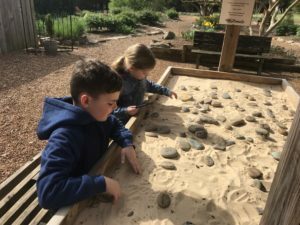 The Children’s Garden is eight gardens in one including dinosaurs, a space rocket, nursery rhymes, water features, open fields, shaded areas and more. This area is all enclosed and offers a space for children to explore and run safely. You can enter the butterfly house from this area. Inside you will find the largest open-aired butterfly house in the nation. Unfortunately, during our visit, the butterflies were in a warmer climate and not flying around, but there were other critters to see inside. The waterfalls, plants, turtles and frogs did not disappoint. The Huntsville Botanical Garden was the best family-friendly garden we have visited. The thought put into creating a place where families can explore the outdoors together is beautifully done. We were able to walk, run, play, dig, splash and relax in a peaceful, serene setting. There is a café with several food and drink choices, but we would recommend packing a picnic lunch and snacks for your visit. Several special events and exhibits are at the garden throughout the year, so be sure to check out their calendar of events before your visit. We could have stayed in the garden all day, but had to make our way back to Louisville. There are so many things to do in Huntsville with kids so if you have more than a weekend, we recommend taking advantage of the city’s offerings. Rocket City Mom is a great resource to learn more about special events and attractions in the city. The 4.5 hours is an easy drive from Louisville and you can even make Nashville a pit stop along the way. Huntsville allowed us to explore history, space and nature as a family. The weekend was a combination of history, education, thrill and tranquility. This is a great area for Louisville families to add to their list of places to visit. Click here for even more travel ideas!